Founded in 1997, Benchmark Senior Living is the largest senior living provider in New England. The community in Shelton, Connecticut is just a short drive from the Connecticut coastline—the Split Rock community is home to about 50 assisted living and memory care residents. In addition to being a LEED-certified facility, Split Rock also exemplifies Benchmark Senior Living’s goal to leverage technology to enrich the lives of residents. To that end, the facility incorporates a range of communication technologies to promote engagement with family and the community. 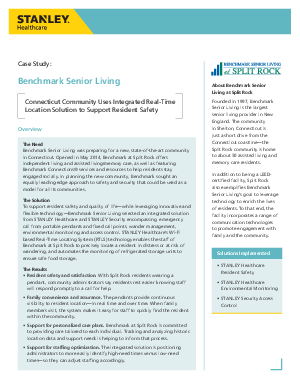 Read this case study to learn about how Benchmark Senior Living selected an integrated solution from STANLEY Healthcare and STANLEY Security encompassing emergency call from portable pendants and fixed call points, wander management, environmental monitoring and access control to improve resident's lives.